The Quality Control Department has acquired the latest analytical equipment and developed the facility for dependable analysis to ensure the safety and reliable quality of drugs. Adhering to strict compliance of the quality control system and by maintaining cGMP standards, we ensure the efficacy and safety of new investigational drugs and APIs by performing rigorous tests for the entire procedure from acceptance of raw materials to intermediate manufacture, product manufacture, and shipment. 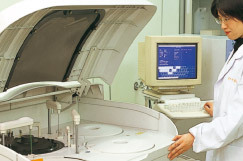 We also provide total support for technical transfer and analytical method validation. Installation of good facility and environment alone is not sufficient for establishing a reliable quality control system. The most important aspect is to inculcate quality improvement awareness in each employee. Each and every employee of Fuji Chemical aims high for contribution to people, future and society, through manufacturing quality APIs and constantly undertaking improvement activities.